One of the best saws I ever owned. Accurate cuts. I bought this saw for a few reasons. Smaller size basement workshop, portability, accuracy of cuts, very good ripfence. It could be less noisy, have better dust collection, and definitely a better miter gage( very sloppy fit). I put on a better blade with 80 teeth for finer cuts. I replaced miter gage with a precision gage from Woodccraft with adjustable fit in slot. I mounted it on a B & D workmate on lower heigth and added a two wheel setup for easily moving. Good saw but with a few shortcomings. 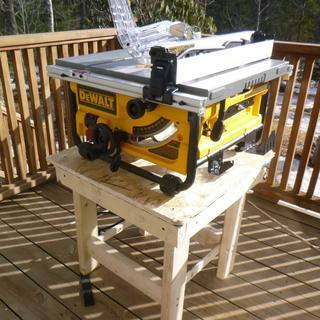 Is there a portable stand that comes with the saw?